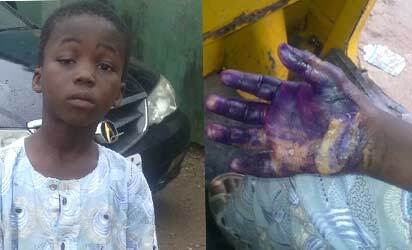 The Lagos State Police Command has arrested a woman, Mrs Aminot Otun, for roasting the right hand of her seven-year-old step-son, Awwal Otun, last Thursday.Awwal’s hand was allegedly roasted for adding drops of liquid disinfectant to his bath water. According to Ngozi Ekwerike-Okoro, President, Child to Child Network, a Non Governmental Organisation, NGO, a distressed call from one of Otun’s neighbours at 59, Suenu Street, Surulere, Lagos saved Awwal’s life. According to his teachers, Awwal, who is in primary one, should not be allowed to go back to his step-mother because he is always coming to school with bruises as the neighbours who pleaded anonymity said that had been the normal punishment for the boy’s mistakes. According to Ngozi, “On July 11, 2013, Awwal was rushed to the Randle General Hospital, Mother and Child Centre, Gbaja, at about 6:30pm after a distress call from neighbours. The boy said he added small quantity of Izal disinfectant to his bath water and his step mother got angry and put his hand on a burning stove since Sunday and he was not taken to hospital till Thursday when neighbours called the Lagos State Child Protection Network who mobilised the JWC Alakara to rescue him.